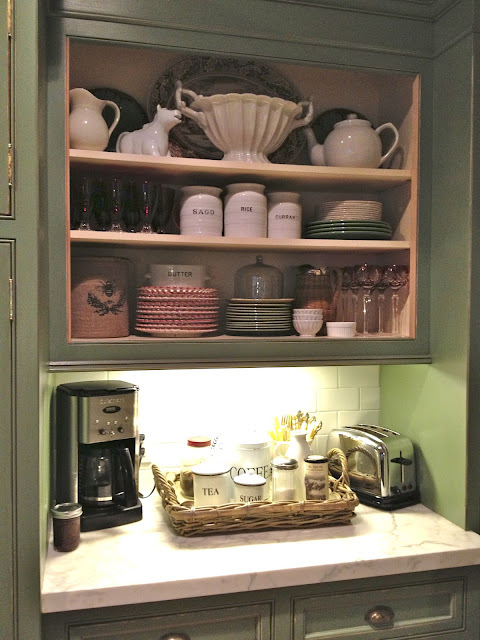 vignette design: Show And Tell: What A Crock! 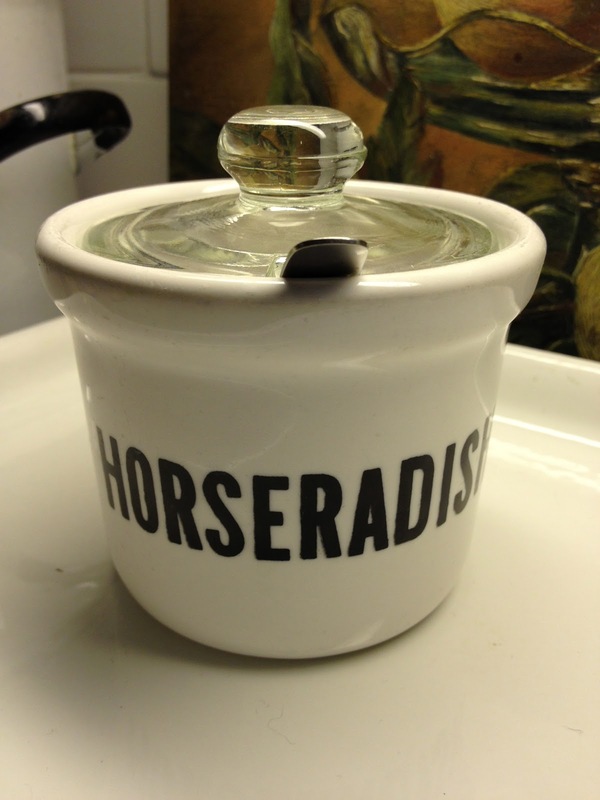 Show And Tell: What A Crock! The minute I saw these crocks, I didn't hesitate. Why? Because they were in a resell consignment store and I knew they would be a deal. Turns out, they were a killer deal! All three crocks for $80. Inside each crock was an individual tag for $89 each. It seems the person who consigned them just wanted to get rid of them. 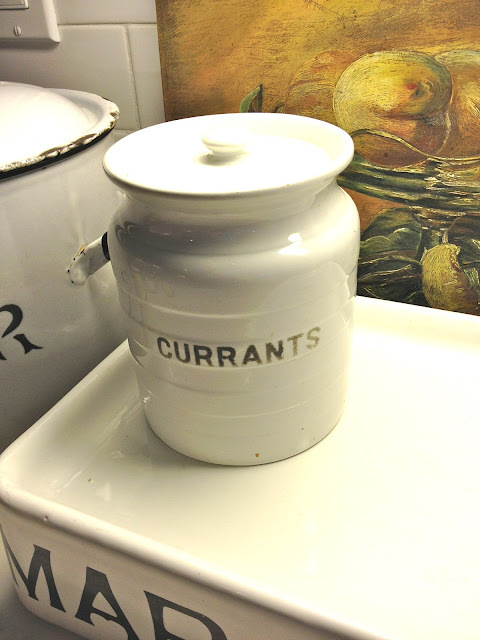 They join my growing collection of ironstone and crockery like this butter crock, sans lid, which I picked up for $5. And this tiny "horseradish" pot that I found on eBay. For now, the three crocks live in the one cabinet that I removed the doors from. 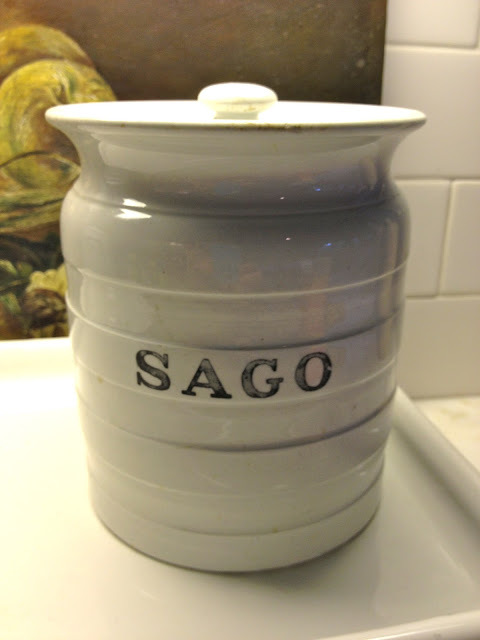 Oh, and by the way, do you know what sago is? It's a flour-like thickener made from palm leaves. The thrifting bug bit me hard this month! So stay tuned for more show and tell. I have heard of Sago palms before but didn't know they were used for cooking. Your collection is growing and growing. I wonder what other great finds you got. 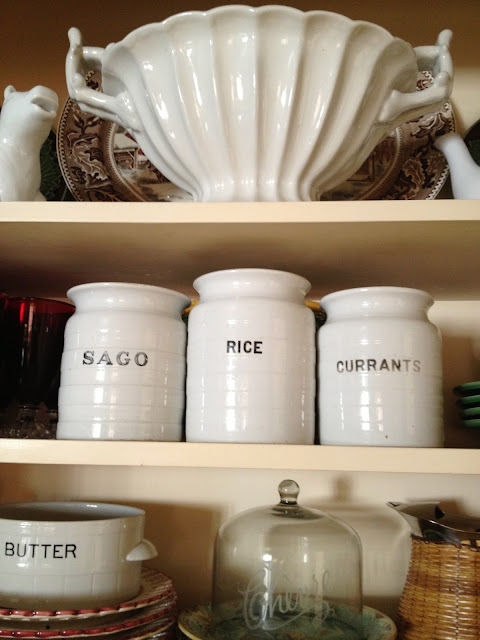 I am a major foodie and I have never heard of Sago. :) But no matter, I love your crocks and would have jumped on them too. Great finds! Love your new crocks!! Words on white is always right!! 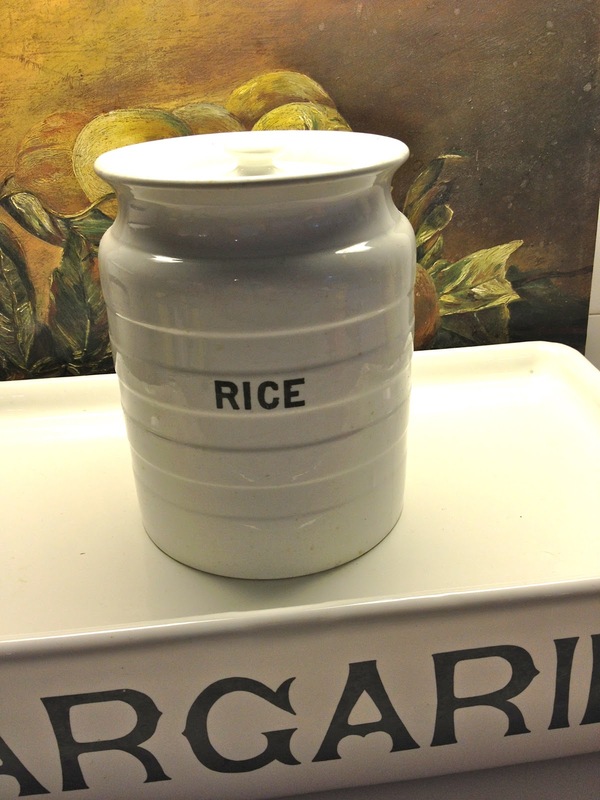 So fun to add them to your collection, perfect for your kitchen. I am still wanting a cheese slab!! Someday!! What a great collection you have going! Love your coffee station. With lids! Good spotting Delores! Sago pudding was a dull spot in my childhood. I so understand the "thrifting bug" and here in the bay area it can be quite rewarding, like these lovelies you scored! I love it when the thrifting bug hits. All kinds of little goodies find their way home. You are getting quite the collection going there and a nice job of displaying them. I love a good find like that... something that looks wonderful that I can use and see every day! I'm headed to the CA coast this weekend to the Remnants of the Past Vintage Show in San Luis Obispo. Can't wait... hope I find one really GREAT treasure! What a great find. They are lovely. Oh no way could you pass these up. perfectly classic pieces! Love the crocks! 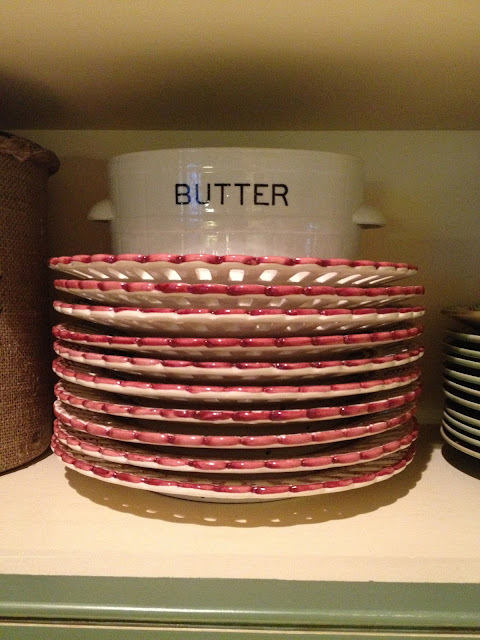 Starting to think I should be collecting ironstone with words, right now I only have plain white. And Dolores, when are you going to do a new tablescape?! I've been waiting..... I LOVE your tablescapes and I need some new ideas. I could look at them all day!! Hoping you will be doing some for Thanksgiving and for Xmas... and maybe a fall one as well?! Delores, you are one lucky shopper! These crocks are terrific. They belong in your beautiful kitchen. Perfection! My maiden name is Sago. That is so cool! I know some people use Sago for cooking, but I never thought it was that much of a staple. How Can You Not Be Romantic About Baseball?